Our multi-disciplinary team combines advocacy, law enforcement, DSS, mental health, and medical professionals in order to provide the most comprehensive care for our child clients. We work with agencies and professionals across Greenville County to help create the best team to meet each clients individual needs. 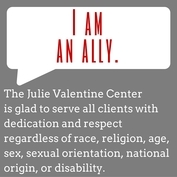 If you are a medical/clinical professional, guardian ad litem, case worker, law enforcement officer, teacher, counselor, or other professional that is involved with a client of the Julie Valentine Center and would like to be a part of the multidisciplinary team please submit the contact form below. If you work for DSS or Law Enforcement and would like to make a referral to the Julie Valentine center for a forensic interview please print and complete the form below. ​***Please note that referrals for investigative interviews can only be conducted at the request of an investigating agency . If you would like to make a referral to the Julie Valentine Center for a medical exam please complete the form below.